Fried, going for his third straight win, gave up his first earned runs of the season and left after the sixth with a 5-2 lead. Ronald Acuña Jr. got the Braves going offensively with a massive, knee-buckling homer, and Johan Camargo’s three-run double in the fifth put Atlanta ahead. 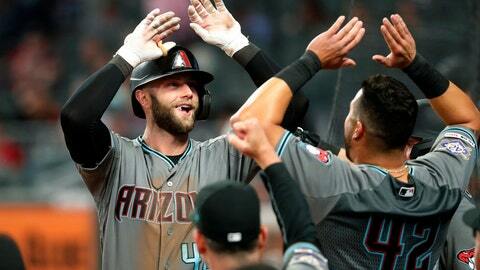 Chad Sobotka and Jesse Biddle didn’t retire anyone as the Diamondbacks pushed across four runs in the seventh to reclaim the lead. With his right knee dipping to the ground as he delivered a mighty swing, Acuña launched a 448-foot shot over the Braves’ bullpen in right-center field, putting Atlanta on the board in the fourth after Arizona jumped ahead 2-0 in the top half against Fried. Atlanta tacked on four runs in the fifth against Robbie Ray. Fried sparked the outburst with a one-out single and came around to score the tying run on Freddie Freeman’s double into the right-field corner. The Diamondbacks walked Acuña intentionally to load the bases with two outs, but Camargo foiled that strategy with a double to the wall in left-center that brought everyone home. Fried, who began the year in the bullpen, has quickly become one of Atlanta’s most reliable starters. The 25-year-old left-hander went six innings, giving up seven hits, walking one and striking out three. With two outs and two runners aboard, a pitch got away from Braves catcher Tyler Flowers. Ketel Marte took off for third and appeared to beat Flowers’ throw, only to over-slide the bag and get tagged out by Josh Donaldson. Braves: Struggling LHP Jonny Venters went on the 10-day injured list with a right calf strain. In six appearances, the 34-year-old reliever has surrendered six earned runs in 2 2/3 innings for a 20.25 ERA, giving up six hits, two homers and five walks. RHP Shane Carle, who began the season in Atlanta, was recalled from Triple-A Gwinnett to fill Venters’ spot in the bullpen and pitched a scoreless eighth, working around two walks.